I’ve always been amazed at how quickly small children learn, even though they’re barely – if at all — talking. At 19 months Maggie learned the color yellow and was telling her surprised grandma about her beautiful “yella” dress. I’m pretty sure William knows the color “blue,” but he’s usually too rambunctious for me to stop and quiz him. Scripture tells parents to teach their children about the Lord from an early age and to talk about Him throughout the day (Deuteronomy 6:5-7). But how do we do that when young children can’t even talk, when their attention span lasts mere seconds? We often hear that children are like “sponges.” Let them soak up God’s Word – no matter the age. Start with the “complex” subjects, and the simple ones, too. 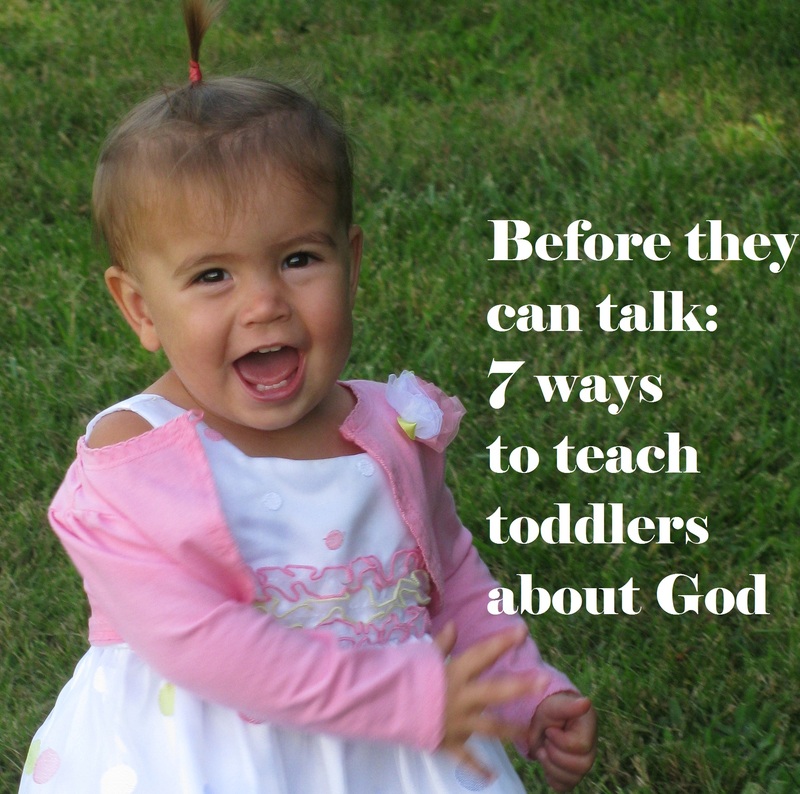 We teach our 1 year olds about Christ’s death, burial and resurrections, but we also teach them more basic concepts – for instance, simply that God made them. 2. Sing – and use motions. Children love to sing and love to hear their parents sing. Sing anything – your favorite hymn, your favorite Christian contemporary song. Get some children’s Christian song CDs for the car. Sing Jesus Loves Me over and over. Sing Scripture. Kids aren’t picky when it comes to their parents singing. Also, use hand motions when at all possible. Our 1-year-old daughter can’t say many words, but she can tell you through hand and arm motions that the “wise man built his house upon the Rock” – and that on Day 4, God made the stars. 3. Read to them. Get a board book Bible and read the great stories of Scripture to your toddler. There are plenty that are designed just for young ones – having few words and lots of pictures of animals. Most board books are somewhat shallow theologically and aren’t all that great for older children, but for toddlers, they’re just fine. (Click here for recommendations.) Also, say Bible verses out loud to them – Genesis 1:1, John 3:16, even the Roman Road verses. 4. Use nature as a tool. Our family loves to be outside, and this presents great opportunities to teach children about God and His wonders. Just about anything you see can be used. “See that beautiful blue sky, Maggie? Who made that sky? See that big green tree? Who made that tree?” Pretty soon, they’ll understand that God must be pretty awesome for making so many big things. 5. Have a family worship time. Sadly, we didn’t start a family worship time until after our twins were born, but we have seen its worth since then. A family worship time will look vastly different depending on the age of your children. For our family – with children ages 5, 1 and 1 – it includes the reading of a short Bible story, the singing of a song, and a short prayer. Make it fun for the children by taking “requests” for songs and stories. All total, for us, it takes around five minutes. 6. Use catechisms. Catechisms are viewed by some Christians as Reformed-only, but – whatever your denomination – they’re a great way to teach young children the basic concepts about God and Christianity. If there’s a question and answer with which you disagree theologically, just skip it. But for the most part a children’s catechism teaches kids only the basic concepts about their faith – who made them and why they were created, for instance. When our oldest son was 3, he had learned answers to the first 20 questions. Toddlers can learn the answer to the first question – who made you? – before they even can talk. Just have them point heavenward. 7. Set the example. Our children can learn about God simply by watching us. Do they see us praying? Do they watch us reading the Bible? Do they witness us exhibiting the fruit of the Spirit? Do they observe us serving others and treating them with respect? Everything we do and say can be negated if we don’t exhibit the spirit of Christ around our own children. This entry was posted in Parents of toddlers and tagged Bible, catechism, Children, Christ, Christianity, family worship time, God, nature, Parents, teach toddlers about god, toddlers, who made you?, young children. Bookmark the permalink. I love it .I’m teaching my little ones Christian songs and bible verses. We always pray before meals . Thanks, Dorothy! That’s so awesome you’re doing that!